Welcome to our Monthly Journal Club! Each month I post a paper or two that I have read and find interesting. I use this as a forum for open discussion about the paper in question. Anyone can participate in the journal club, and provide comments/critiques on the paper. This month’s paper is “Rocking promotes sleep in mice through rhythmic stimulation of the vestibular system” by Paul Franken and colleagues at The University of Laussane in Switzerland. I will provide a brief overview of the techniques/approaches used to make it more understandable to potential non-expert readers. If I am not familiar with something, I’ll simply say so. There’s a whole market around baby-rocking equipment….and apparently some people will pay upwards of $1200 for one (Credit: Happiest Baby, Inc). This month I’ll be discussing an interesting paper that tackles a topic that every parent is familiar with - rocking a baby to sleep. Why is it that gentle rocking helps us sleep…be it in a crib, car, or a loved one’s arms? Kompotis and colleagues addressed this question using a basic science approach in mice. I was surprised a study like this hadn’t been done before, as everyone seems to just ‘know’ that gentle rocking promotes sleep, without knowing how or why. To test this question, they equipped mice with EEG/EMG electrodes to monitor brain and muscle activity (to determine sleep states), and monitored these signals for two days of no movement and one day of rocking in the horizontal plane (at 0.25, 0.5, 1.0, and 1.5 Hz) followed by a final stationary day (shown below). They chose to start with 0.25 Hz as that is a frequency that has shown to promote sleep in humans. They found that 1.0 Hz (i.e., 1 rocking motion/second) was the optimal frequency for mice, as 0.5 Hz was too little, and 1.5 Hz promoted non-rapid eye movement (NREM) sleep at the expense of REM sleep. They tried 2 Hz as well, but it was obviously discomforting to the mice so they capped out their experiments at 1.5 Hz. To determine how rocking influenced the quality of sleep, in addition to the amount, the authors investigated the frequency components that make up the EEG (i.e., spectral analyses). In the sleep field, sleep intensity is known to correlate with increases in NREM delta power (slow waves; 0.5-4 Hz) in the EEG, so if rocking increased NREM delta power then we could speculate that it increased sleep quality in addition to amount. However, the only frequency that seemed to influence delta activity within the EEG was rocking at 1.5 Hz, where it actually caused delta power to decrease! This suggests that rocking at 1.0 Hz promotes more sleep, but this sleep is not any ‘deeper’ or ‘intense’ than normal sleep. Indeed, rocking too fast may decrease the quality of sleep. Rocking at 1.0 Hz did, however, alter the spectral (EEG frequency) components of wakefulness and REM sleep, two states that exhibit predominant theta (~6-9 Hz) rhythmic oscillations. Specifically, 1.0 Hz rocking increased low-theta and decreased high-theta frequencies during both total wakefulness and a state known as ‘active’ or ‘theta-dominated wakefulness’ (TDW; see above). A shift in the spectral components of wakefulness from higher to lower frequencies is associated with building sleep pressure and a pending transition into sleep. To investigate a mechanism for rhythmic rocking-induced sleep, the researchers tested whether otolithic organs of the vestibular system (which monitor our head’s linear acceleration) were necessary for the effect. They tested this using mice lacking functional otoliths (nicknamed tilted mice; Otop1-tlt/tlt). When they put these mice through their rocking experiment, they showed no enhancement of sleep like their counterparts with intact otolithic organs. A final question was whether the main driver of sleep was the rhythmic (i.e., frequency) component, or the linear acceleration applied to the mouse. To test this, they equalized the linear accelerations of both the 1.0 and 1.5 Hz rocking frequencies to 178 cm/s^2. When this was done, the effect on sleep was equalized, supporting the notion that linear acceleration, rather than frequency, is the important component of rocking-induced sleep. Interestingly, vestibular afferent nerves are 3-4 times less sensitive to stimuli than those in monkeys or humans. When the authors applied this conversion to the minimal sleep-enhancing linear acceleration that affected sleep in mice (79 cm/s^2), the numbers matched those that promote sleep in humans (20-26 cm/s^2). An interesting note that the authors make is that other sensory modalities (e.g., vision, proprioception) could further be responsible for rocking-induced sleep, as tilted mice still had these systems intact. However, this is unlikely, as there was no compensatory effect in these mice, suggesting that the majority of the effect was driven by the vestibular system (see below). A very interesting finding from this study is that the vestibular system contributes to sleep-wake control. As the authors discuss, future studies should examine downstream pathways relaying linear acceleration signals to known sleep circuitry (e.g., the pedunculopontine tegmentum) in the brain. So…next time you try to rock your baby or pet to sleep, remember that the linear acceleration is key! 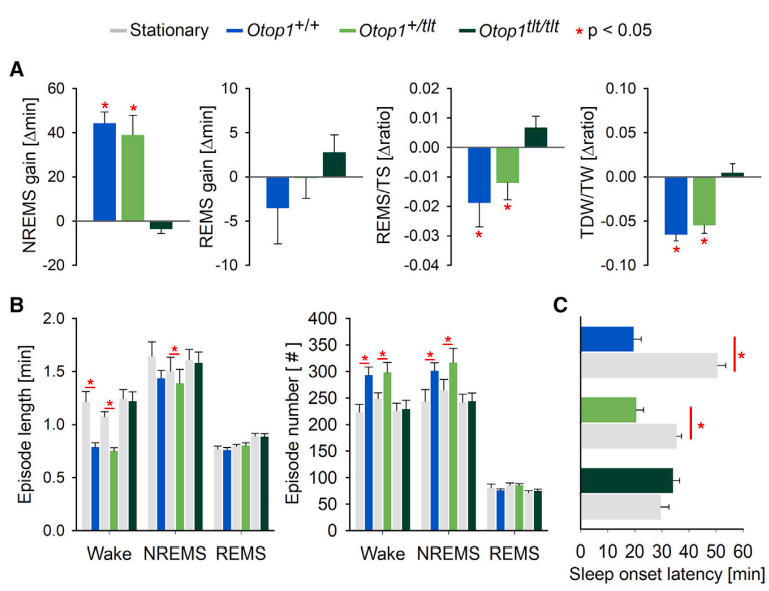 Mice lacking functional otolithic organs (tilted mice; Otop1^tlt/tlt above) do not enhance their sleep in response to rocking (Credit: Kompotis et al., 2019). Older PostMy Top 5 Coolest Studies of 2018!